Judith Weingarten, an archeologist and scholar of Palmyrene history and culture at the British School at Athens, notes, “This is a typical Palmyran formula for the dead: name + descent or description + lament.” On Regina’s stone, she points out, the Palmyrene script is more grammatical and expertly carved than the Latin. This and the generally Palmyrene style of the monument suggest that the sculptor may have been a Syrian. But who did Barates think would read it? 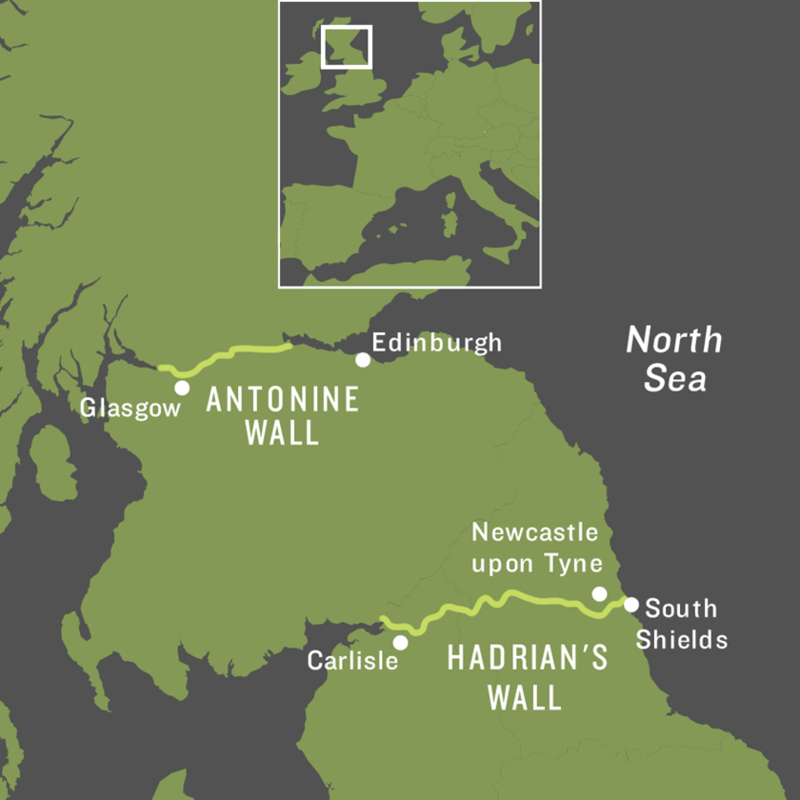 Hadrian’s Wall belted Britannia between what is now South Shields and Carlisle; the later Antonine Wall was about half the length of Hadrian’s. Syrian archers served at both. At the time he commissioned Regina’s tombstone, there were some 500 archers from Hama, Syria, serving the Roman army in northern Britannia, less than 80 kilometers from Regina’s resting place. The Roman fort at South Shields—then called Lugudunum—guarded the primary port of entry for men and supplies heading to the network of forts and watchtowers along Hadrian’s Wall, which defined the northern edges of Roman rule. It is thus quite possible that Syrian archers passed this way en route to and from their duty posts along the wall. David Devine, author of Hadrian’s Wall: The Northwest Frontier of Rome (1995), calls the wall “the greatest surviving monument to the military power of Rome.” Having first conquered Britain—Britannia in Latin—in 43 ce, Rome extended its control northward. Nearly a century later in 122 ce, Emperor Hadrian came to inspect these northern holdings. More a consolidator than an expansionist, Hadrian was concerned that the empire was overextended in some areas and, as a result of his visit to northern Britannia, ordered a wall be built from coast to coast to delimit the empire’s northern reach. The stone barricade took six years to build, and it stretched 118 kilometers from near today’s Newcastle upon Tyne west to Carlisle. Several Roman forts already existed along this route, and the wall passed near them or, in some cases, intersected them. “Milecastles”—small guard stations spaced apart by a Roman mile (1.48 km)—fortified the wall, and two watchtowers or turrets were built at intermediate points between each. The wall rose four and one-half meters, and a deep ditch along its north side made assault even more difficult. The Romans, however, did not design the wall so much for defense as for surveillance. The walkway along the top was not wide enough to serve as an effective fighting platform, but it did provide a vantage point from which to spot potentially hostile forces in the distance. This early warning allowed Roman forces to pass through the gates in the wall to engage enemies according to preferences of Roman military doctrine: in the open field. In central portions along the route, where even the terrain itself would make assault almost impossible, the wall nevertheless continued unbroken, sometimes on the edges of high escarpments. It was thus more of a political than a military statement: “Here Roman rule stops. North of this point, we have no responsibility.” Of course, the wall also served to control the flow of people as well as valuable—taxable—commerce. Today, most of what we know about the wall comes from archeology. One such find includes the earliest evidence of a Syrian presence in the region: a “diploma,” or discharge from military service, dated July 17, 122 ce, that entitled its recipient to Roman citizenship. Another diploma was found dated November 124, and another dated in 132. Both were written for men serving in the unit of Syrian archers. 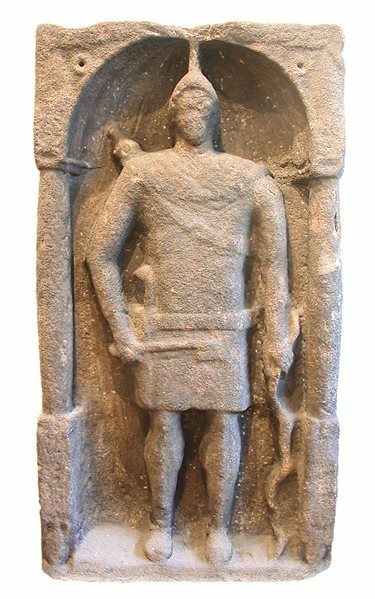 Even more impressive is a tombstone preserved in the Great North Museum: Hancock at Newcastle upon Tyne that shows a Syrian archer, bow at his side. 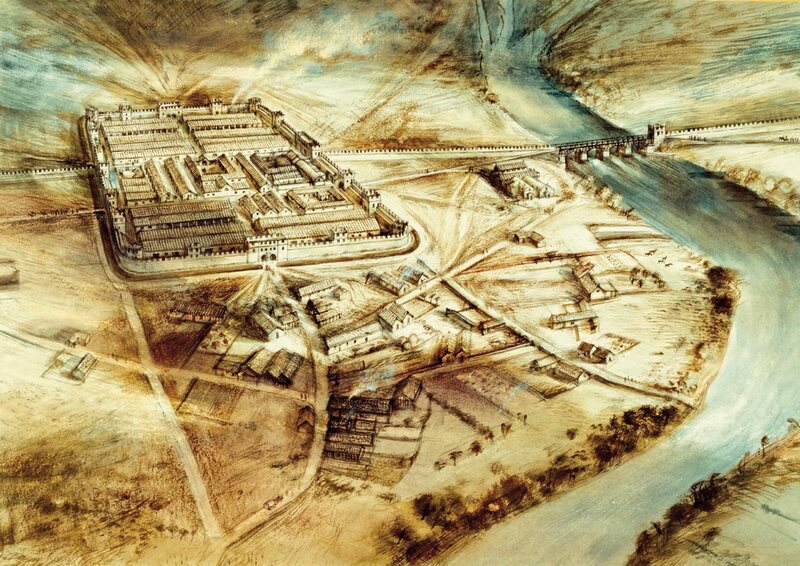 In this artist’s conception of a Roman fort bestriding Hadrian’s Wall along the River Tyne, fields and granaries outside the garrison hint at how Romans and locals may have mixed. These Syrians served alongside as many as 8,000 Roman soldiers from different parts of the empire, all separated into special units (numeri). Feeding them all was a logistical challenge, and archers capable of expert hunting would have helped. After Hadrian died in 138 ce, Rome briefly tried to expand its control north. Hadrian’s successor, Emperor Antoninus Pius, commanded the construction of a new wall, “the Antonine Wall,” some 150 kilometers north of Hadrian’s Wall. Largely of earth on a stone foundation about four meters wide and only three meters high, it required as much support as Hadrian’s—up to 8,000 Roman soldiers. Other excavated tombstones from settlements along Hadrian’s Wall evoke the Syrian archers, who were valued for their proficiency with the composite (or recurved) bow, which appears in this funerary relief at lower right. Composite bows shoot farther than conventional longbows, and they are more compact. Archeological evidence from a fort at Bar Hill, an important fort along the Antonine Wall, shows that from approximately 142 to 158 ce, Syrian archers performed duty along this wall, too. In 1895 outside the Bar Hill fort, an altar was discovered, built to Silvanus, a Roman god of woods and fields, dedicated by Caristianius Iustianus, a prefect of the First Cohort of Hamians. 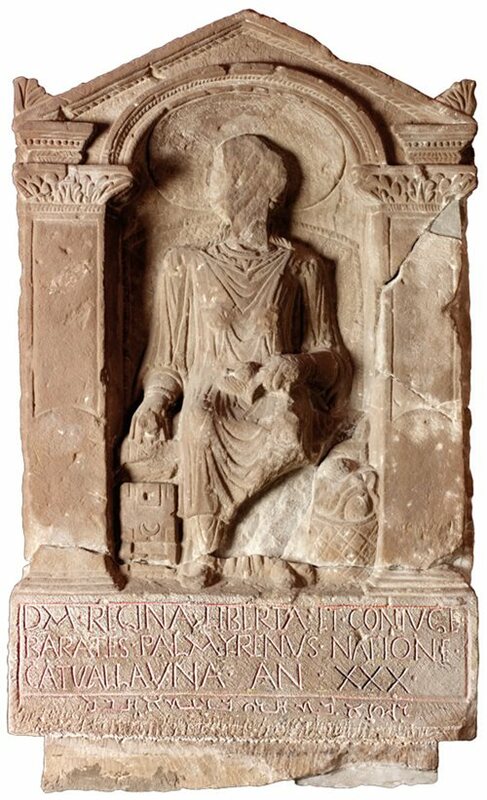 A tombstone found near Bar Hill in 1603, now lost, bore the inscription, “To the spirits of the departed (and) of Gaius Julius Marcellinus, prefect of the First Cohort of Hamians.” These artifacts reveal that Syrians served not only in Britannia but also in Caledonia, now Scotland. 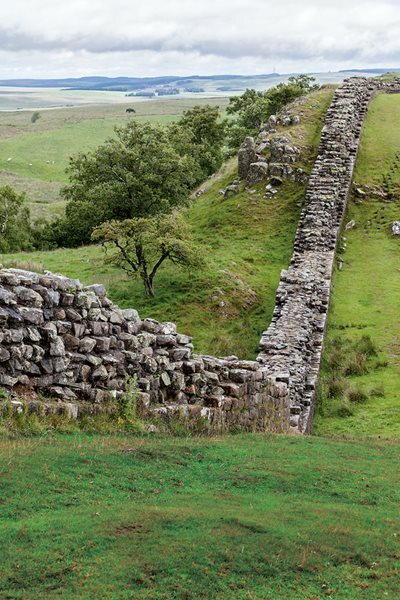 In 158, when the order came from the emperor to withdraw from Caledonia, the Roman army abandoned the northern wall and repositioned back along Hadrian’s Wall. Syrians serving Rome in Britannia were not allowed to bring their wives and families, and indeed, it was not until the reign of Emperor Septimius Severus (193–211) that even Roman soldiers were permitted to marry. Even after that, only officers were allowed to have their wives live with them inside the forts. Perhaps not surprisingly, archeological evidence shows that a local settlement sprang up in the environs of virtually every fort. Such proximity gave locals opportunities to sell goods and services to the Roman garrisons—and to mingle. There is no reason to believe that Syrian archers would not have met locals—including women. Such may have been the case for Barates and Regina. The tombstone inscription identifies Regina as a “Catuvellaunian,” of a tribe known to have inhabited central Britannia around the time. With no evidence to explain their meeting, questions of Regina’s background remain: Could she have been the daughter of a stonemason working in the north? A trader, who in some way brought her to the attention of Barates? As on her tombstone, (“Alas!”), we simply do not know. 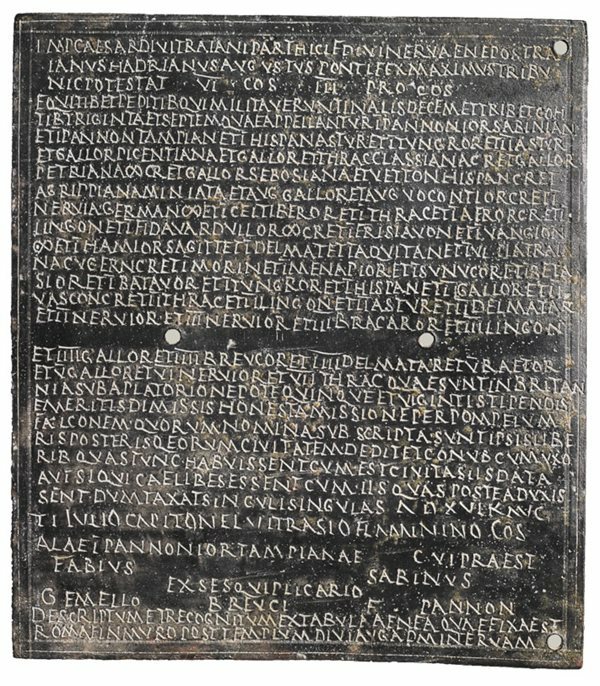 Syrians, like others who completed the Roman army’s standard 25-year term of service, received diplomas such as this one, found in Britannia, dated July 17, 122 ce. 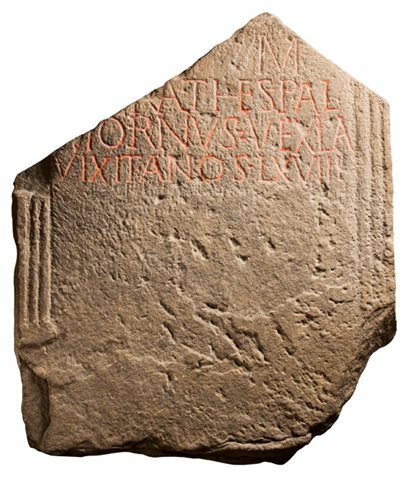 As for Barates, his identity hinges on the Latin term vexillarius, used to individualize Barates on his own tombstone, discovered in 1911 at Corstopitum (today’s Corbridge), some 48 kilometers west of Regina’s tombstone in South Shields. “Vexillarius” translates as either “flagbearer” or “vendor of flags and banners.” Barates, it appears, was neither a member nor a veteran of the Roman army. It is thus plausible that he was instead a Syrian merchant or trader—not an archer. This, however, is not an entirely satisfactory answer: Was there really enough commerce selling flags and banners to sustain a man and his wife (and children?) in a manner sufficient to warrant Regina’s elaborate tombstone? Indeed, there is not even proof that the Barates of Corstopitum was also Barates, husband of Regina of Lugudunum. Barates was a common Syrian name at the time, and it is the proximity and dating of the gravestones that makes the supposition plausible. shortly after his visit to Britannia. In 129, he visited Palmyra. Top: Hadrian visited Britannia once, in 122 ce. Above: In 208, Emperor Septimius Severus traveled to Britannia with his wife, Julia Domna, of Emesa, now Homs, Syria. He remained there until his death in 211 in York, England. Perhaps Barates dealt in more than flags and banners. Mary Beard, professor of classics at the University of Cambridge, notes, “There were Roman traders swarming over the eastern Mediterranean, cashing in on the commercial opportunities that followed conquest, from the slave trade and the spice trade to more mundane army supply contracts.” Similarly, a Syrian merchant might well have traveled in the opposite direction, especially if archers, possibly even ones known to him, were bound for Britannia. While only new archeological discoveries may offer answers regarding Barates’s identity and motive, the capabilities of the archers were well known. Roman rule over Syria dated from at least 64 bce, when Pompey annexed the province. In 70 ce the town of Emesa (modern-day Homs, some 160 kilometers north of Damascus) sent archers to aid the Roman siege of Jerusalem. Hadrian knew Syria, having first visited in 117 and again in 123, shortly after his visit to Britannia. He visited Palmyra a few years later in 129. 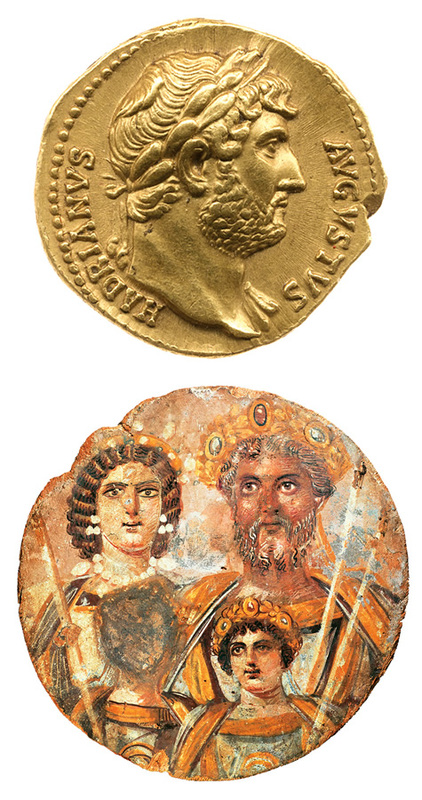 Half a century after Hadrian’s rule, Septimius Severus, who would later become the empire’s first emperor from North Africa (Roman Libya), married Julia Domna, a Syrian from Emesa, in 187. The two traveled to Britannia on a military campaign in 208, and they were still there when Severus died three years later, in York. The story of a Middle Eastern presence in Roman Britannia did not end there. About 125 years later, at the close of the third century, Rome brought a contingent of boatmen from the Tigris River to the River Tyne-North Sea area to replace sailors Rome needed elsewhere in the empire. We learn this from the Notitia Dignitatum, a listing of the empire’s important officeholders. Among the offices in Roman Britannia was Praefectus numeri barcariorum Tigrisiensium Arbeia (Commander of the Company of Bargemen from the Tigris at Arbeia). Reconstructed as a museum in South Shields, the gate to what was once the Roman fort of Lugudunum stands at the mouth of the River Tyne. By the late third century ce, the area around the fort was known as “Arbeia”—likely meaning “Arab house,” after boatmen from what is now Iraq were stationed there. Excavations at South Shields reveal that around the end of the third century, the Romans launched construction at the fort to enlarge grain storage and build 10 new barracks. This suggests that, by this time, Arbeia played an important role in supplying grain to the garrisons stationed along the wall. However, no Roman road has been found linking Arbeia to the nearby fort at Corstopitum, 48 kilometers upriver. The shallowness of the River Tyne would have required the use of small boats or lighters—a task for which boatmen from the Tigris would have been well suited. From Corstopitum, grain could be delivered farther west by road. Paul Bidwell, head of archeology at Tyne and Wear Museums in Newcastle upon Tyne, and Nicholas Hodgson, who manages the museum’s archeological projects, believe that the Tigris boatmen also performed patrol duties along the North Sea coast, “anticipating, intercepting, and pursuing seaborne raiders from [the] north who attempted to bypass the Wall,” says Hodgson. This would have been a much more challenging task, but Hodgson reasons that from the time of Diocletian, in the third century ce, confrontations with the Persians on Rome’s eastern frontier could have produced boatmen “long trained and effective in aquatic operations.” To facilitate the training needed to operate in the open sea, the bargemen may have blended into local units upon arrival in Britannia. This fragmentary tombstone commemorates a man named Barates, who archeologists speculate may have been the Palmyrene husband who erected a memorial to his Britannian “freedwoman and wife,” Regina. How long did the men from the Tigris stay in Britannia? What did they do when their services ended? Did some remain and blend into the local population? The dearth of firm evidence is both frustrating and tantalizing. “These are mostly great unknowns,” says Hodgson. Two factors suggest many may have remained. First, after 25 years of service, Roman law granted citizenship to military volunteers, who were then also exempt from taxation. If they completed a 25-year term of service, it seems likely that many would have established family relationships in Britannia during this time. Second, at the end of his service, a man who had been recruited in another province had to find his own way home—there was no help with travel expenses. David Breeze and Brian Dobson, archeologists specializing in Hadrian’s Wall, think that for these reasons most military veterans preferred to stay near where they had served. This would have applied no less to the archers: How many had left wives and children behind, and after 25 years in Britannia, how many would have returned? In 411, the Romans withdrew their legions from Britannia, though contact and trade continued for several centuries. From that era, we are left with a single, faceless, poignantly inscribed memorial to link us to bonds of devotion, forged through the vast instrument of an empire, between two people from widely divergent cultures, enriching them both. Charles O. Cecil ([email protected]) served 36 years in the US Foreign Service, and he retired in 2007 to devote himself to photography and writing. His images are online at www.cecilimages.com.